It's the kind of gadget you'd expect to see in a movie featuring James Bond, Ethan Hunt (Mission Impossible) or the men from The Man From U.N.C.L.E. Researchers have built a miniature laser microphone using parts costing less than $80. This device can be used to 'read' the keys pressed on a personal computer 50-100m away. The laser pen, developed by Inverse Path, has been used in a demonstration to show how it can detect keystrokes made by a PS/2 keyboard that is plugged into a PC. 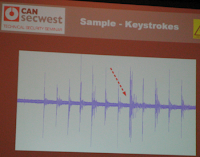 According to Cnet, which was covering the CanSecWest security conference last month, "Chief Security Engineer Andrea Barisani and hardware hacker Daniele Bianco used a handmade laser microphone device and a photo diode to measure the vibrations, software for analyzing the spectrograms of frequencies from different keystrokes, as well as technology to apply the data to a dictionary to try to guess the words. They used a technique called dynamic time warping that's typically used for speech recognition applications, to measure the similarity of signals."